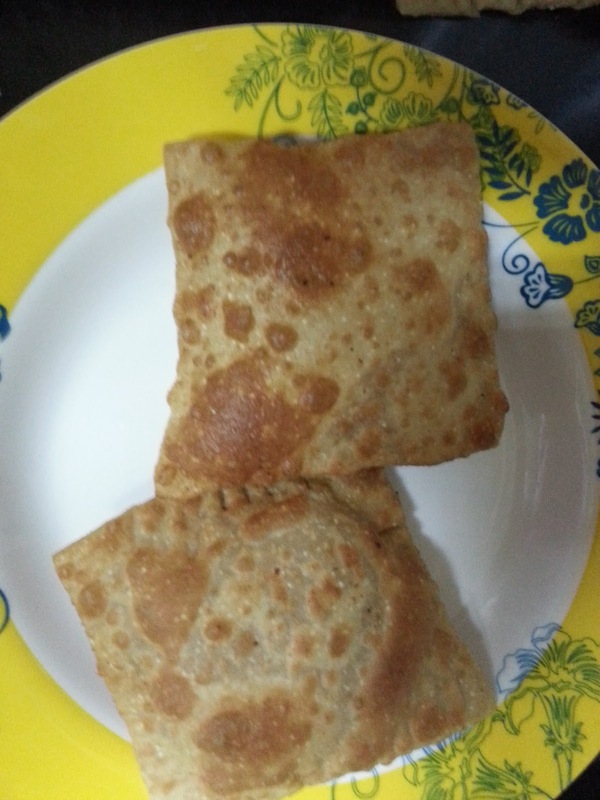 Luqmi / Lukhmi are mince filled savory snack or starter of Hyderabadi origin. Ground Paste of 2 peppercorns, 1 Teaspoon coriander seeds, 1 green cardamom, small piece of cinnamon, few cumin seeds. 1. wash and clean the minced meat and drain all the water. use a mesh strainer to make it easier. 2. Boil and cook the minced meat in water adding some salt and the ginger garlic paste. 3. In a pan, heat the ghee, add the chopped onions and saute for a minute. 4. Add the ground paste and saute for a minute or two. 5. Add the cooked minced meat followed by red chilli powder and turmeric powder. 6. Cook till the raw smell of the chilli and turmeric powder disappears. If needed add very little water as the minced meat when done needs to be completely dry to use as the filling. 7. Add the coriander leaves, stir and turn off flame. 8. Let this stuffing cool down. 1. In a mixing bowl add the All purpose flour, semolina, salt, soda, cumin seeds and mix well. 2. Add the yogurt and mix well to combine. 3. Add milk and knead till the dough is mixed and comes together. 4. Add ghee and knead the dough till it turns soft and elastic. 5. Cover the bowl with a plastic wrap and leave it aside for 30-40 minutes. 1. Take the dough that has been resting and divide it into small portions. I made about 8 portions. keep it covered. 2. Roll one of the dough portions into a small chapatti using some wheat flour to dust. 3. Roll another dough portion into a small chapatti of the same size of the previous chapatti. 4. Place some of the prepared minced meat filling in the center of the first chapatti. 5. Dip your fingers in some water and apply all over the circumference of the chapatti. 6. Place the second chapatti on top of the first and press the edges to seal across the circumference. Make sure there is no trapped air. 7. Take a sharp knife and cut the luqmi into a square. I used a pizza cutter. 8. seal the edges by crimping using a fork. 9. Place the prepared luqmi on a tray and cover with a damp kitchen towel while you prepare rest of the luqmis. 10. You can use the chapatti pieces that were cut out to form the square and reuse them. 11. Make luqmis in similar manner till all the dough is used up. 12. Heat oil in a kadai. Reduce flame to low. 13. Fry the luqmis one or two at a time depending on the size of the kadai making sure you do not over crowd. 14. When golden brown and done, remove to a plate lined with paper towels to soak the excess oil.